Retail ecommerce sales worldwide will continue to post solid gains in 2017, rising 23.2% to $2.290 trillion. This year, for the first time, ecommerce sales will account for one-tenth of total retail sales worldwide. 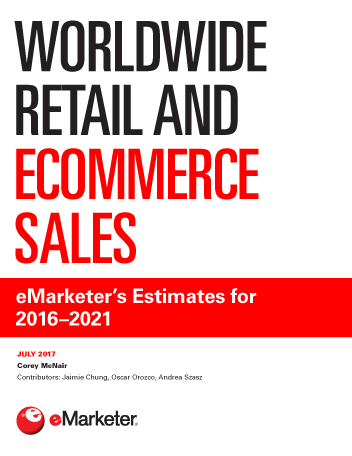 eMarketer has lowered its estimates for worldwide retail sales throughout the 2016–2021 forecast period, mainly due to the other currencies’ weak exchange rates relative to the US dollar. Retail sales will grow 5.8% this year, reaching $22.737 trillion, largely driven by sales in China. Retail ecommerce sales worldwide will increase at four times the rate of retail sales this year, jumping 23.2% to $2.290 trillion. Ecommerce sales growth will stay in the double digits throughout the forecast period. China and the US will combine for $1.584 trillion in ecommerce sales this year, representing 69.1% of global ecommerce. In 2017, mobile commerce will account for more than 70% of ecommerce sales in both China and India, and 59.0% in South Korea. In Germany, the UK and US, mcommerce will comprise at least one-third of total retail ecommerce sales. "Worldwide retail ecommerce sales will reach $2.290 trillion in 2017, making up 10.1% of total retail sales. This share will surpass 16% by 2021, when sales will hit $4.479 trillion."